A good company mascot doesn't have to be perfect -- it doesn't even really need to be associated in any way with the actual product. After all, we have tigers and deranged old sea captains peddling children's cereal, so as long as you don't have somebody named "Oren C. Thirstrapist" trying to sell people Kool-Aid, you're probably going to be fine. And even if your idea is terrible, chances are there will be one or two people around the agency who see the folly of your creation. A commercial has to pass before several sets of eyes before it even gets filmed, let alone before it makes it to television. This is why GE's new ad for its hospital equipment is so confounding. The minute-long spot features Hugo Weaving, reprising his most famous non-elf role as the menacing Agent Smith from The Matrix, lurking through a hospital like he's scouting for potential ransoms and explaining the exciting new technology General Electric has been developing. It's part of GE's "Brilliant Machines" campaign, which showcases a bunch of famous robots from pop culture all convening on GE Headquarters to help them build the future of automated technology, and for some inexplicable reason they decided to center their commercial about networked hospital machines around one of the most evil characters in the history of science fiction. To their credit, this was actually way more entertaining than The Matrix Revolutions. The Matrix, as you may remember, is a movie about soulless robot overlords (Agent Smith included) enslaving the human race, using them as a power source, and liquefying their dead bodies to feed to other enslaved humans. We are puzzled as to why nobody at any level of GE's infrastructure thought to mention that Agent Smith perhaps wasn't the best choice of spokesman for their hospital tracking equipment, because automatons feeding jellied people remains to newborn infants born in tubes is the absolute last image a person wants on his mind as he disappears into the hollow blackness of an MRI machine. "I'm too terrified to move." They even stick Agent Smith's famously murderous face on the outside of the machine and have him leering over some surgery patient's gaping chest, just in case anyone forgot whose hands they were putting their lives into. "Is he ... flirting with the life support machine?" 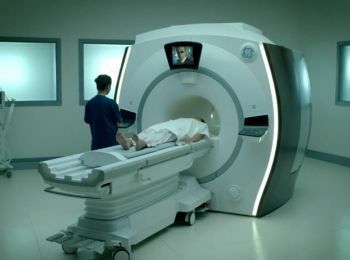 Then, Agent Smith proudly informs us that GE technology can track our vital signs anywhere in the hospital and beam them directly into a vast computerized network. This is an area he knows a thing or two about, because in the movies, Agent Smith's exact function was to track people across a vast computerized network. And then kill them. "Keep the bracelet on, it makes my job a lot easier." Seriously, has no one in GE ever seen The Matrix? Literally any other robot in the history of film would have been a better choice -- even RoboCop would've made people feel more at ease, because at least he's a police officer. Agent Smith is an unfeeling death machine built by other unfeeling death machines for the explicit purpose of tracking down rogue humans and destroying them, and GE selected him to star in an ad about technology that tracks humans. Is his stamp of approval supposed to impress us or terrify us into submission? The last image GE leaves us with is a bunch of Smith clones haunting an empty waiting room, assuring us that their new technology will make long waits at the hospital a thing of the past. Agent Smith's very presence forces us to question whether the room is barren because the equipment is just that effective or because he has killed all of the sick people for being weak and inefficient.